The arthroscope is an optical (pertaining to the eye) instrument that allows doctors to view the inner workings of a moveable joint without having to perform surgery. The instrument is a flexible narrow tube containing several bundles of hair-thin glass fibers that are covered with a reflective coating. A highly intense light source, usually a halogen lamp, is used to transmit light along one bundle of fibers toward the target area inside the joint (a place where two bones are joined, usually so that they can move). 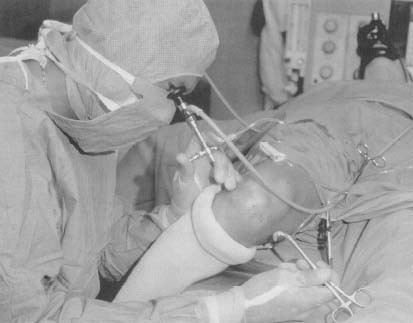 Doctors perform arthroscopic knee surgery on a patient. Because there is less damage to the surrounding tissue, arthroscopic procedures usually allow patients to heal faster. Another bundle of fibers carries an image of the target area back up the tube where it is viewed through an eyepiece. Crude versions of the arthroscope were used as early as the nineteenth century and included long, rigid tubes illuminated by candles. The first efforts to develop the kind of glass fibers that would eventually be used in arthroscopes were made by the Atomic Energy Authority and the Rank Organization in England. By 1965, a 25-micron (a micron is one-thousandth of a millimeter) fiber had been produced which was quickly followed by the development of a 15-micron (a much finer) fiber. When the American Cytoscopic Company succeeded in sterilizing glass fibers, the possibilities for medical uses of the arthroscope increased greatly. The modern arthroscope contains additional features in the form of air and water channels for flushing water through or inflating targeted areas. Miniature instruments can be placed at the tip of the arthroscope to perform simple operations. Used with a laser beam, the instrument can control localized bleeding. Because the size of the incision (cut) needed to insert the arthroscope is small, surgery within a joint is less traumatic for patients. With less damage to the surrounding tissue, patients heal faster and regain use of their joints with less pain and in less time.